Why is Mental Health relevant in the SDGs? We can make impact by considering mental health within the full range of policies and programmes. In the new global consensus on development priorities, health is increasingly seen as an essential component of overall sustainable development, and as a positive outcome of successful achievement of human rights, social, and environmental targets. Similarly, mental health is essential for sustainable human development. Addressing mental health is an essential step in addressing key development issues such as social inclusion and equity, universal health coverage, a holistic and life-course approach to health, access to justice and human rights, and sustainable economic development. ﻿There has also been a lack of understanding of its links with other serious global problems and how the failure to tackle depression undermines the fundamental human rights of hundreds of millions of people. (...) Too often and in too many societies, those with mental health problems face discrimination and isolation." 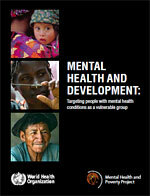 Mental health has for too long been a low priority in development. Psychosocial disabilities are increasingly recognized as resulting in individual social exclusion, and being an important factor frustrating the aspirations of families, communities and emerging economies. According to the World Report on Disability, 1 billion people worldwide experience a disabling condition. The WHO estimates that 1 in 4 people will experience an episode of mental disorders or psychosocial disabilities in their lifetime, and that approximately 600 million people worldwide are disabled as a consequence. Most (85%) of these people are in Low and Middle Income Countries. Psychosocial disability is one of the most pressing development issues of our time. Poverty and hunger, conflict and trauma, poor access to health and social care, and social inequity are significant risk factors, increasing vulnerability to persons with psychosocial disabilities in low and middle income country contexts. 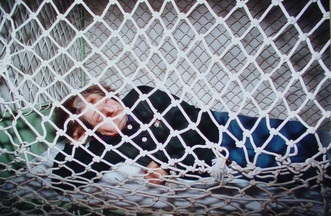 There is documented evidence from all regions of the world that people with psychosocial disabilities experience most severe human rights violations, including being tied to beds, kept in isolation in psychiatric institutions, being chained and caged in small cells, and being physically abused by ‘traditional’ healing practices. This failure of humanity is a global emergency and requires immediate and sustained action. Human rights violations are linked to discrimination and stigma towards people with mental disorders and psychosocial disabilities. Change requires a focus on human rights and stigma reduction and a change in attitudes and beliefs. Recent systematic analyses show that mental and behavioral problems account for 7.4% of the global burden of disease measured using Disability Adjusted Life Years (DALYs) . Mental and behavioral problems command nearly one-quarter of the global total. This is the biggest single cause, more than cardiovascular diseases and cancer combined. In high income countries men with mental health problems die 20 years and women 15 years earlier than people without mental health problems. In low income countries this gap is likely to be much wider. This mortality gap must be recognized as a human rights issue. Mental health is related to many other aspects of health and development. As well as being critical to success in addressing poverty and economic development, there are strong links to almost all the other Millennium Development Goals. Likewise Mental health status has impact across the whole range of thematic areas for emerging post-MDG priorities. The WHO has considered this in the Global Mental Health Action Plan (2013-2018) and the QualityRights program. Globally, there is chronic under-investment in psychosocial disabilities, and a huge mismatch between investment by governments and the relative burden. Low income countries spend about 0.5% of their very limited health budgets on psychosocial disabilities, despite them causing 25.5% of the YLDs. This under-investment in mental health services has resulted in a huge treatment gap. In low income countries, less than 20% of people are able to access services. In some countries, and for more severe disorders such as schizophrenia, the treatment gap is as wide as 98%. Services are often non-existent, or based in large cities, far from people who may need them. This lack of access to treatment breaches the fundamental right to accessing health care. Improving access to treatment, combined with improving human rights, is the key call to action to improve the quality of life of person with psychosocial disabilities. Recently, global development budgets saw growing recognition of the essential place of addressing psychosocial disabilities in development. 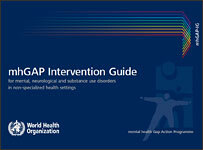 The EU and several high-income governments focus on scaling up services for mental health in LMIC, the WHO Mental Health Gap Action Programme (mhGAP) aims to provide evidence-based resources for governments and civil society to scale up services for mental, neurological and substance use disorders in low- and middle-income countries. Awareness is increasing about the issue, yet, more commitment is needed by governments to budget adequately for psychosocial disability treatment and services. Global development organizations and governments need to commit to this principle. Persons living with mental and substance abuse problems, and their families are often stigmatised by societies. This short documentary is from a patient perspective in Nepal.